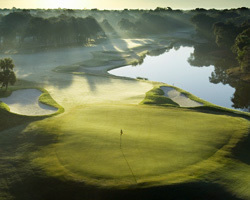 Most know of Kiawah Island, South Carolina for being home to the world class five course Kiawah Island Golf Resort. More than just the Resort this coastal Island is a thriving municipality and home to about 1400 residents. For property owners on the vast island playground there are two other golf facilities that rival premier private golf experiences anywhere. 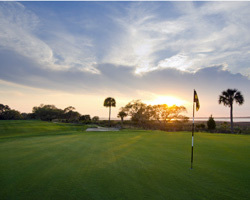 A Kiawah Island Club membership features two exceptionally unique designs, Cassique by World Golf Hall of Famer Tom Watson and The River Course by Tom Fazio. 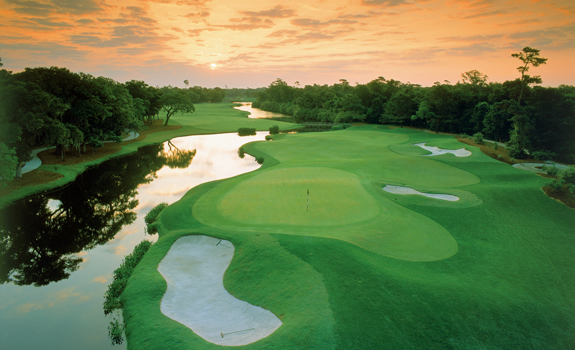 The River Course is situated on the northern shore of the island along the Kiawah River. This Fazio true championship test is routed with 5 holes playing along or over the tidal coastline. Typically playing 3-4 shots harder than its sister course, the designer has blended holes framed by gator filled ponds, encroaching live oaks and customary Fazio bunkering making every shot a test of your meddle. The tight tree lined fairways are the first test on your way to par with the multi-tiered, wickedly sloped greens the final challenge in navigating The River Course. With a name like The River Course, it is fitting that the holes for this shot-makers feature plenty of water. The scorecard lists Hole 5 as the shortest par 4 on the routing. Don’t let that fool you with a false sense of ease. Playing tough as nails this dogleg left tempts you with a drive that has to avoid water and bunkers left and a distant bunker down the right. The approach is best made from the left of the landing area as the green slopes severely right to left and front to back. The 8th, named Pond, is a massive three-shotter that is all about setting aside the nerves of the tee shot. Playing as a forced carry all over water, the drive must not leak right or risk a difficult second from a trench bunker or worse a drop out of the gator habitat. The green is tucked tight to the water right with a huge back plateau that makes a perched pin as tough a shot as you will find with a wedge. The 13th is a deceptive par 5 that is set up by the driver. 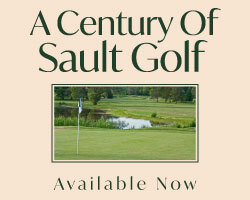 The safe play is a lay-up short of the pond leaving a mid iron into the large green protected short and right by the pond. Bombers have a chance at getting home with a perfectly struck fairway wood drifting left to right off the aiming bunkers left of the green. The finale is a devilish dogleg left that plays to a raised fairway guarded on the left by a cluster of enormous live oaks. 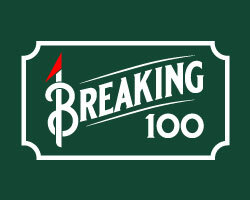 The best play is right to left trying to catch the down slope of the fairway to get a mid iron in your hand. The alternative is a fairway wood off the tee to the plateau and a long iron avoiding the trees left and right to the elevated green perched next to the stunning Kiawah River.